Por ordem do Pentágono todos os caças F-35 Lightning II dos EUA devem ser mantidos no solo até instruções em contrário. A decisão veio na sequência de um acidente ocorrido no último dia 28/9 próximo a base aérea de Beaufort, South Carolina, com um F-35B - versão VTOL utilizada pelo US Marine Corps. Não houve mortes nem ferimentos em decorrência do acidente, com o piloto conseguindo se ejetar a tempo. Trata-se do primeiro acidente com um F-35 desde que começou a voar há 12 anos atrás. Investigators appear to have pinpointed problems with the aircraft’s fuel tubes and will now inspect the tubing on the entire fleet. If suspect fuel tubes are installed, the part will be removed and replaced. 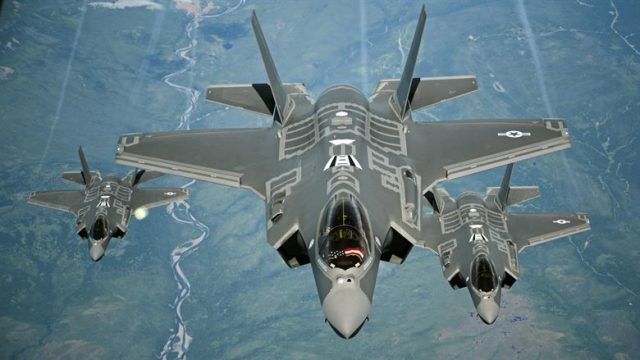 If known good fuel tubes are already installed, then those aircraft will be returned to flight status, Joe DellaVedova, a spokesman for the Pentagon’s F-35 office, told CNBC. Inspections are only expected to take about two days. The F-35 Joint Program Office (JPO) requested on 10 October that the US Air Force, Navy and Marine Corps inspect the aircraft’s Pratt & Whitney F135 turbofan before flying again. Some aircraft have already resumed flights after inspections, such as those at Lockheed Martin’s Fort Worth, Texas facility and Luke Air Force Base, while others continue to undergo tests of the fuel tube. Lockheed Martin has delivered more than 320 F-35s to the US military and international customers. The fuel tube issue impacts all three variants of the aircraft: The F-35A conventional takeoff and landing variant, the F-35B short take-off and vertical-landing variant, and the F-35C carrier-based variant. O caso é mais um pesadelo para a já complicada situação operacional da frota de caças dos EUA, atribuída a cortes do orçamento militar nos últimos anos. Ainda assim, o secretário de estado James Mattis, quer que os EUA sejam capazes de colocar no ar simultaneamente pelo menos 4 de cada 5 caças atualmente em operação. As a result, fighter fleets are in poor shape. In 2017, only 70.22 percent of the Air Force’s F-16C fighter jets were considered ready for action. Just under half of F-22A Raptors, or 49.01 percent, are ready. In the Navy and Marine Corps, 44 percent of F/A-18 Hornets are ready for action, although those older aircraft are relegated to the Navy Reserve and Marine Corps. The Navy’s Super Hornet force stands at 53 percent. The F-35 program is, of course, no exception. In March, the office that manages the F-35 program reported readiness stood at 51 percent across all three versions and all three services. Drilling down a bit readiness levels varied wildly depending on the age of the plane: earlier production F-35s averaged only 40 to 50 percent readiness while newer planes averaged 70 to 75 percent.